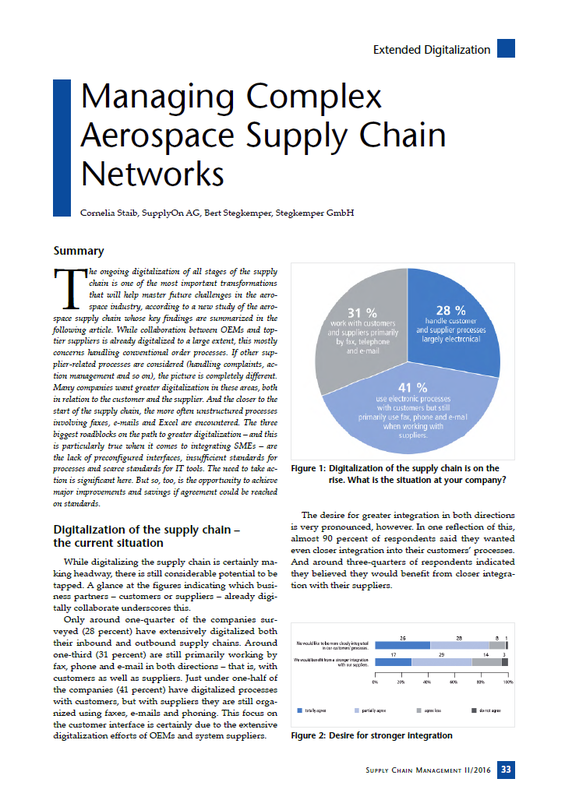 The ongoing digitalization of all stages of the supply chain is one of the most important transformations that will help master future challenges in the aerospace industry, according to a new study of the aerospace supply chain whose key findings are summarized in the following article. While collaboration between OEMs and top-tier suppliers is already digitalized to a large extent, this mostly concerns handling conventional order processes. If other supplier-related processes are considered (handling complaints, action management and so on), the picture is completely different. Many companies want greater digitalization in these areas, both in relation to the customer and the supplier. And the closer to the start of the supply chain, the more often unstructured processes involving faxes, e-mails and Excel are encountered. The three biggest roadblocks on the path to greater digitalization – and this is particularly true when it comes to integrating SMEs – are the lack of preconfigured interfaces, insufficient standards for processes and scarce standards for IT tools. The need to take action is significant here. But so, too, is the opportunity to achieve major improvements and savings if agreement could be reached on standards.